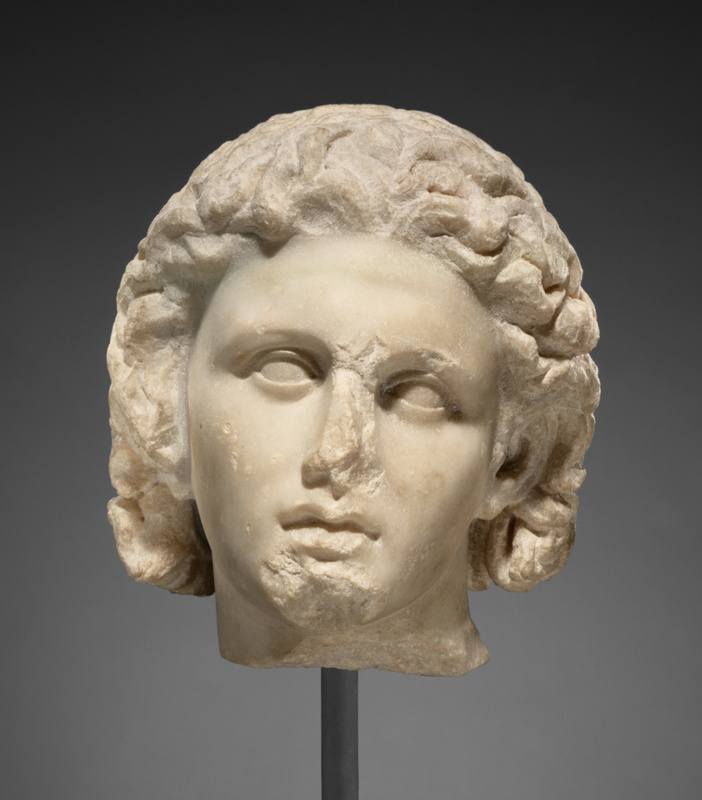 Identified by his mass of leonine hair, his young idealized face, and his deep-set, upturned eyes, Alexander the Great was the first Greek ruler to understand and exploit the propagandistic powers of portraiture. Ancient literary sources say that he let only one sculptor carve his portrait: Lysippos (active ca. 370-300 B.C. ), who created the standard Alexander portrait type. This life-size head, said to have been found in Megara, was part of a multi-figured group, which probably served as a funerary monument for a courtier who wanted to associate himself with the ruler. The Getty Museum has over thirty fragments of this group, which might have depicted a sacrificial scene. The participants include Alexander, his companion Hephaistion, a goddess, Herakles, a flute player, and several other figures, as well as animals and birds. The head was re-carved in antiquity. The left ear was added, the right sideburn shortened, and the lower eyelids recut. Robin Symes, Limited (London, England), by partial credit and partial purchase, sold to the J. Paul Getty Museum, 1973. Lipsius, Frank. Alexander the Great (London: Weidenfeld & Nicolson, 1974), ill. p. 84. Guidebook: The J. Paul Getty Museum. Rev. ed. (Malibu: J. Paul Getty Museum, 1976), p. 47; ill. p. 48. Fredericksen, Burton B., Jiří Frel, and Gillian Wilson. Guidebook: The J. Paul Getty Museum. 4th ed. Sandra Morgan, ed. (Malibu: J. Paul Getty Museum, 1978), pp. 29-30, ill.
Frel, Jiří. Antiquities in the J. Paul Getty Museum: A Checklist; Sculpture I: Greek Originals (Malibu: J. Paul Getty Museum, 1979), p. 7, no. 20. Vermeule, Cornelius C. Greek Art: Socrates to Sulla; From the Peloponnesian Wars to the Rise of Julius Caesar. Art of Antiquity 2, pt. 2 (Boston: Dept. of Classical Art, Museum of Fine Art, 1980), pp. 126, no. 71, 215, fig. 71A, ill. The Search for Alexander. An Exhibition. National Gallery of Art, Washington, D.C., Nov. 16, 1980-April 5, 1981; Art Institute of Chicago, May 14-September 7, 1981; Museum of Fine Arts, Boston, October 23, 1981-January 10, 1982; Fine Arts Museums of San Francisco: M. H. de Young Memorial Museum, February 19-May 16, 1982. New York Graphics Society: 1980, pl. 2, bottom; p. 101, no. 6, ill.
Frel, Jiří. Greek Portraits in the J. Paul Getty Museum (Malibu: J. Paul Getty Museum, 1981), pp. 68-69, 112, no. 19. The J. Paul Getty Museum Appointment Calendar (Malibu: J. Paul Getty Museum, 1981), week of February 16. Vermeule, Cornelius C. Greek and Roman Sculpture in America (Berkeley and London: University of California Press, 1981), no. 101. Stewart, Andrew. Review of "The Search for Alexander." The Art Bulletin 64, no. 2 (June 1982), pp. 321-26. Frel, Jiří. "Ancient Repairs to Classical Sculpture at Malibu." The J. Paul Getty Museum Journal 12 (1984), pp. 73-92; p. 81, no. 23. Giuliani, Luca. Bildnis und Botschaft: Hermeneutische Untersuchungen zur Bildniskunst der römischen Republik (Frankfurt: Suhrkamp, 1986), pl. 34, p. 153 ff. The J. Paul Getty Museum Handbook of the Collections. 1st ed. (Malibu: J. Paul Getty Museum, 1986), p. 32. Smith, R. R. R. Hellenistic Royal Portraits (Oxford: Clarendon Press, 1988), p. 158, cat. no. 16; pl. 12, 6. Stewart, Andrew. "Ethos and Pothos in a Portrait of Alexander the Great." Abstracts and Program Statements, College Art Association, 77th Annual Meeting, February 16-18, 1989, p. 60. Ridgway, Brunilde S. Hellenistic Sculpture I: The Style of Circa 331-200 B.C. (Madison: University of Wisconsin Press, 1990), pp. 116, 134-35. Stewart, Andrew. Greek Sculpture: An Exploration (New Haven, CT: Yale University Press, 1990), p. 191, 192; fig. 576. Stewart, Andrew. Faces of Power: Alexander's Image and Hellenistic Politics (Berkeley: University of California Press, 1993), appendix 5, "The Getty Fragments: A Catalogue," pp. 438-52, pp. 438-39, no. 1; pl. 2; figs. 16, 146-49. Grossman, Janet Burnett, and Elizabeth C. Teviotdale. The Making of a Hero: Alexander the Great from Antiquity to the Renaissance, exh. brochure (Malibu: J. Paul Getty Museum, 1996), ill. The J. Paul Getty Museum Handbook of the Collections. 4th ed. (Los Angeles: J. Paul Getty Museum, 1997), p. 23. Towne Markus, Elana. Masterpieces of the J. Paul Getty Museum: Antiquities. (Los Angeles: J. Paul Getty Museum, 1997), pp. 60-61. Grossman, Janet Burnett. "Images of Alexander the Great in the Getty Museum," Studia Varia from the J. Paul Getty Museum 2, Occasional Papers on Antiquities 10 (2001), pp. 51-78; pp. 51-53, no. 1; figs. 1a-d. The J. Paul Getty Museum Handbook of the Collections. 6th ed. (Los Angeles: J. Paul Getty Museum, 2001), p. 23. Pfrommer, Michael, with E. Towne Markus. Greek Gold from Hellenistic Egypt. Getty Museum Studies on Art (Los Angeles: J. Paul Getty Museum, 2001), pp. 8-9, fig. 7. The J. Paul Getty Museum Handbook of the Antiquities Collection (Los Angeles: 2002), p. 25. Grossman, Janet Burnett. Looking at Greek and Roman Sculpture in Stone (Los Angeles: J. Paul Getty Museum, 2003), pp. 50, ill.
Queyrel, Francois. Les portraits des Attalides: Fonction et représentation. BEFAR 308 (Athens: École francaise d'Athènes, 2003), p. 170n227. Spivey, Nigel and Squire, Michael. Panorama of the Classical World (Los Angeles: Getty Publications, 2004), p. 176-177, fig. 275. Reinsburg, Carola. "Alexanderbilder in Ägypten: Manifestation eines neuen Herrscherideals." In Fremdheit - Eigenheit: Ägypten, Griechenland und Rom: Austausch und Verständnis. P. C. Bol et al., eds. (Stuttgart: Scheufele, 2004), p. 324, fig. 8. Foreman, Laura. Alexander the Conqueror: The Epic Story of the Warrior King (Cambridge, Da Capo Press, 2004), p. 16. The J. Paul Getty Museum Handbook of the Collections. 7th ed. (Los Angeles: J. Paul Getty Museum, 2007), p. 5, ill. The J. Paul Getty Museum Handbook of the Antiquities Collection. Rev. ed. (Los Angeles: J. Paul Getty Museum, 2010), p. 25. Ogden, Daniel. Alexander the Great: Myth, Genesis and Sexuality (Exeter: University of Exeter Press, 2011), p.157, figs. 8.1-8.2. Picon, Carlos, and Sean Hemmingway, eds. Pergamon and the Hellenistic Kingdoms of the Ancient World (New Haven and London: Yale University Press, 2016), pp. 111-112, no.13a, ill., entry by Jens M. Daehner.